Hello everyone! Jerm here with an update on or my favorite upcoming Tampa Bay area events! The second annual Dine Tampa Bay Restaurant Week kicks off Aug. 19 and will offer residents and visitors another chance to experience some of the area’s finest restaurants. Participating locations will showcase their dinner options by offering $25, $35, or $45 prix-fixe, three-course menus (appetizer, entrée and dessert) throughout the week. Each participating restaurant will provide a special Restaurant Week menu in addition to their standard menu, which will suggest three options for each course. Diners can choose from old favorites to the latest culinary hot spots, nationally known chain restaurants to local chef-owned bistros, Asian or Spanish fare to Italian, fondue, tapas and sushi, and from the award-winning restaurants of downtown Tampa to the gourmet gems on the beaches. Dine Tampa Bay Restaurant Week begins Aug. 19 and runs through Sept. 2 and more than 60 area restaurants are participating. Prices are per person and exclude beverages, tax and gratuities. 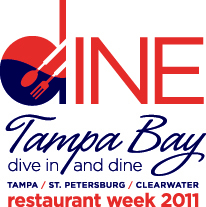 For more information about Dine Tampa Bay Restaurant Week, including a list of restaurants, chef bios, and other event information, log on to www.DineTampaBay.com. That&apos;s all for now, but be sure to stay tuned in for more updates on things to do in Tampa Bay!